Hand flapping has become one of the more popularly recognized signs of autism. As with any concept that takes hold in our society, we have to deal with both the positives and negatives. In one sense, it’s great that the potential signs of autism are becoming more widely known. Three cheers for autism awareness! In another sense, assuming that hand flapping=autism is far too simplistic and fails to understand the nuances behind the behavior. So, you’re a parent of a child (with autism or not) and you see them starting to flap their hands. Given everything you’ve heard about hand flapping from the media and greater society, you start to panic. 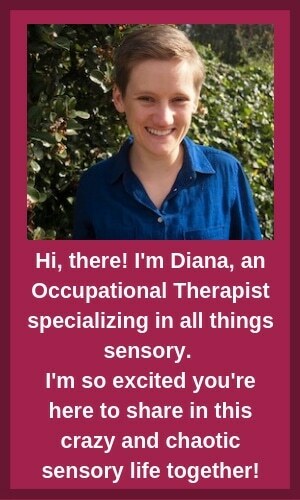 Should you panic and immediately get your child to an occupational therapist? Well, no. Let’s dig in! What is hand flapping exactly? Have you ever seen a video like this one where someone gets so excited that they can’t help but throw their arms up and scream? Maybe you’ve been that person! Aside from how fun these reactions are, our bodies actually need this tom foolery in order to stay regulated. Sensory system–enter from stage right. As we go through our days, we constant take in sensory information, send it to our brain, and then spit out a response. We hear our favorite song and start tapping our feet; we feel a tap on our shoulder and turn around; we smell some chocolate chip cookies and walk towards the kitchen. If we don’t struggle with sensory issues, our bodies are generally great at taking in sensory information and processing it in a productive way. We generally don’t even notice it, as it is such a fundamental part of life. That said, there are times when our brains just can’t handle the amount of sensory information we’re throwing their way. We get overwhelmed in a noisy shopping mall and walk outside; we hear a loud noise and cover our ears; we get exciting news and start jumping around like fools. This is essentially what’s happening with hand flapping. Our child’s sensory system is getting more information than it can handle, so it has to spill out in other ways. What the heck is a stereotypy? In the medical world, behaviors such as hand flapping are called “stereotypies.” You may be more familiar with the word “stimming” or “self-stimulatory behavior”—a stereotypy is the same thing. One of the most important things to note is that stereotypies don’t usually interfere with the ability to perform tasks. While they may be an involuntary, 98% of people in the study mentioned above were able to stop on cue. This makes stereotypies different from tics, seizures, or other involuntary movements we may encounter. So, why is my child hand flapping exactly? Basically, when your child gets excited or stressed, their brain doesn’t always have an outlet for the reaction. It’s like a pot of water that suddenly boils over. There’s no more pot left to hold the water, so the water has to spill out over the stove. Think back to our video of the excited, jumping people. Have you ever felt that way? Been so overwhelmed with excitement or emotion that you couldn’t help but respond physically? This is what’s happening for your child when they’re hand flapping. 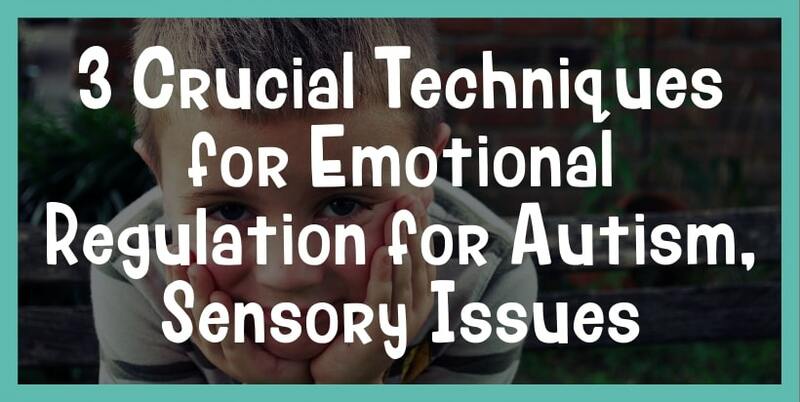 Check out another great post from The Sensory Toolbox about emotional regulation! The excitement or stress is just too much for their brain to handle and it has to spill out into a physical reaction. Self-stimming behaviors serve as a way for kids to regulate their bodies. When their feeling excited or anxious, a good stereotypy will help them calm down. Is hand flapping a sign of autism? Yes and no. 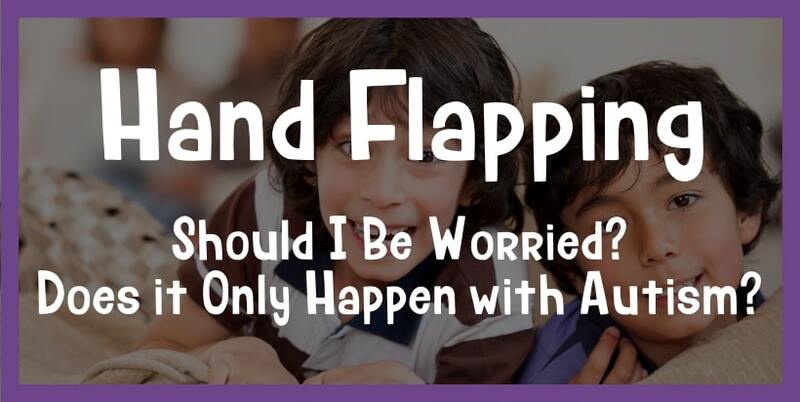 A lot of kids with autism participate in hand flapping, but not all kids who participate in hand flapping have autism. So, while hand flapping is one of the more obvious signs of autism, it doesn’t mean that autism is in the cards 100%. If you child starts hand flapping, it’s best to check in with a pediatrician or occupational therapist. Hand flapping alone is definitely not justification for an autism diagnosis, but you will want to investigate it further. If your child starts hand flapping, be observant about the circumstances under which it’s happening. Is your child excited, stressed, or fatigued? Does it happen at certain times or places? The more information you can gather, the easier it will be for a profession to determine what’s going on. Should I be worried about hand flapping? From a physical standpoint, stimming and hand flapping are rarely hazardous. That said, stimming is a term that can be applied to any number of behaviors and they may not all be safe. If your child hits their head against a wall in order to self-stim, for example, it may be best to redirect that behavior. With hand flapping and any other stimming behaviors, be on the lookout for anything that may cause injury. Stimming and hand flapping don’t pose much of a hazard from a mental standpoint either. When your child is self-stimming, they are simply using unique strategies for calming themselves. The biggest potential problem is when a child’s stimming behaviors are negatively impacting the other tasks they have to complete in a day. If your child struggles to complete their homework because they don’t want to stop hand flapping, you may want to chat with your occupational therapist about redirection strategies. If your child self-stims but can be easily redirected to complete their tasks when needed, there’s likely no harm in it. One of the bigger issues we see with hand flapping is the social stigma surrounding it. Unfortunately, we live in a society where anything “different” is looked at strangely, if not questioned. Kids can often be embarrassed by their self-stimming behaviors and, if they’re not, their parents may be. This is nothing to be ashamed of! It can be challenging enough to go to the grocery store with kids in tow, let alone with everyone staring at your child’s hand flapping. None of us like to admit we’re embarrassed by our kids, especially when it relates to behaviors we know our kids can’t control. That said, we need to have this hard conversation with ourselves and understand exactly why we’re concerned about the self-stimming behaviors we’re seeing in our kids. Is there a valid concern here? Or, is it just different? As with anything, check in with your child’s occupational therapist before making any decisions or taking any action. This information was interesting. I had heard of stimming and now I know what our son often has are tics. I think these are brought on by anxiety around his dyslexia or boredom for him. Have you any advice how to calm these down for him as he is aware and gets frustrated with himself. Sorry if this isn’t on topic. Hi, Claire! Yes, stimming and tics can look really similar. I’m so glad that this helped in seeing the difference!